I've only found 5 War Nickels in my short experience as a detectorist, but my first 4 have all clean up very nicely under running water and maybe some dish soap. 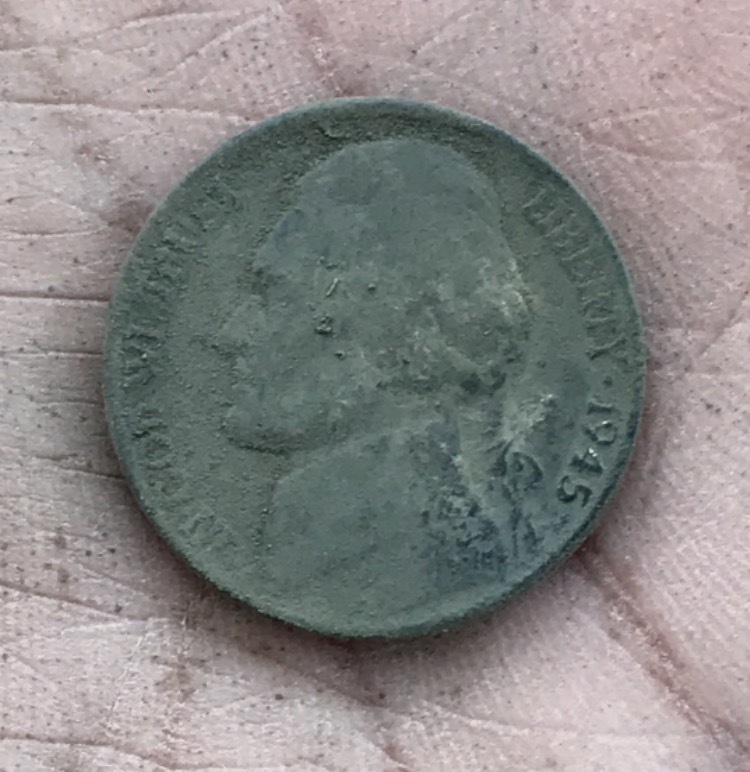 Last week I found my first stubborn, crusty War Nickel - no amount of water and dish soap removed any of the yellow crud and black sulfur crust that encrusted the entire nickel. I remembered having very good results using aluminum foil, baking soda, and hot water on a Merc dime that I found last year that had heavy black sulfur staining that wouldn't come off any other way, so I decided to try that on the War Nickel, too. I was so confident that it would work, I even decided to film the process and make my first metal detecting related YouTube video. Well, it was a flop - as good as the technique worked on the Merc, it didn't even touch the crud on the War Nickel! The best theory I can come up with is that the low silver content in the War Nickel coupled with the extreme crud coating just isn't enough to feed the electrochemical reaction. So, I changed gears and got more aggressive than I've ever been with cleaning a silver coin: scrubbing with a toothbrush and baking soda. Still no results at all - the nickel looked just as crusty as ever. What finally worked? The lowly pencil eraser! Wracking my brain, I finally remembered reading a post or watching a video were someone recommended using a plain old eraser to shine up crusty, lost-cause silver coins. 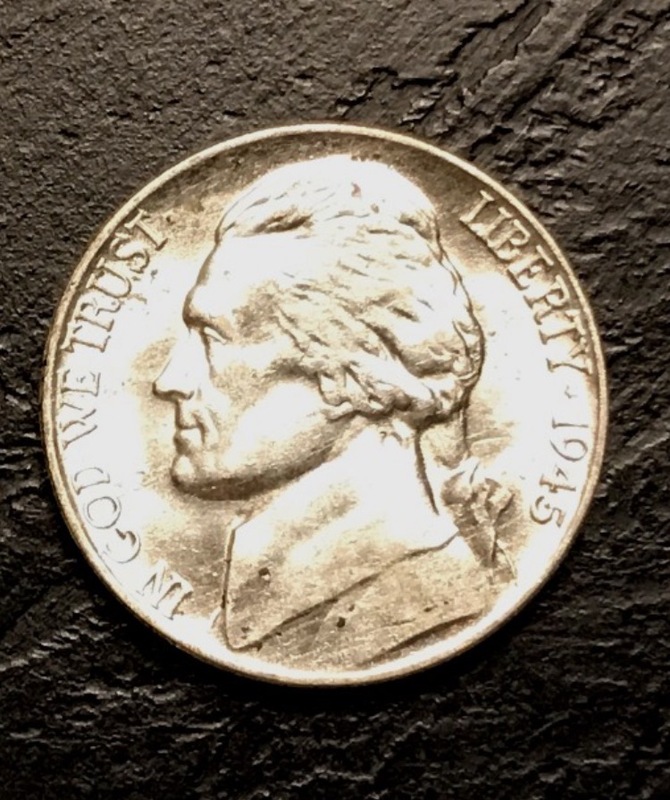 Figuring I had nothing to lose because the nickel was pretty shot, I set to work - and 20 minutes later, I was down one complete eraser, but I had gained a pretty nice looking 1945 P War Nickel! That looks Pretty Freaking good AMT !!! 1000% better, Thanks for the Tip !! You certainly put a lot of work into it and learned a few things...came out very nice especially considering how rough it was.. Thanks SoOregonMd! I was pretty amazed how well it turned out - I really didn't expect much considering my other "go to" methods failed. Thanks joe! It was a great learning experience, and I'm certainly surprised and happy with the results! I have used lemon juice and water mixed about 50/50 with good results. You just have to be careful about leaving it in too long or they sort of look white with very little luster. Looks like your method worked out pretty well. You sure used some elbow grease to clean up that crusty war nickel! The end result turned out nice though. I've always used ammonia with good results. Usually a 5-10 minute soak does the trick. Followed by toothpicking/toothbrushing with ammonia. If it's super crusty, either a whack with a hammer and/or a good 15-30 minute ammonia soak works well. Once most of the crust is off and you've got minimal black spots, a baking soda scrub will sometimes help. Here's a pretty black war nickel I found with a before and after using the ammonia and then baking soda method. Wow - thanks for sharing that, Waveoff! That turned out really well, and I bet it was far less effort! I'll try that on my next crusty one too - can't hurt to have several different methods to try. Thanks for posting this one -tango. I hope to dig some crusty silvers this year, so I can try some of these techniques. A baking soda scrub is usually enough for my silvers. Maybe I'll get to break out a pencil eraser on something. Heck of a nice job.. excellent results.. I found that doing the tin foil, baking soda, hot water method worked great on my war nickel. Cleaned it perfectly.